We are now using a new way for taking orders using an order form. In the past there was too much confusion on how much an order will cost. Now you can see exactly how much your order will cost before you order. The order form opens in a new window or new tab so close any pop up killers. The form has all my products listed in categories. Wigs, beards, DVD's ,etc, etc. For some of the products you will need to specify size, if you want styling and what kind of styling. When you fill something in the price will automatically update itself at the bottom of the page. All the prices are in Swedish Krona but a link for exchange rates is provided. You will also be given the chance of choosing what kind of shipping you want. 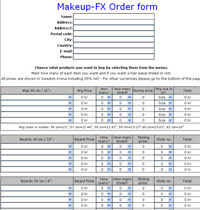 Makeup-FX will always confirm the shipping costs before payment is done but we have put it on the order form so will will have a better chance of knowing exactly how much your order will cost. If you have any special requests or instructions such as extra speedy delivery or tell us about your project so we can help you better, please do this in the bottom box. So just fill in your order and press "Submit". Your order is then sent to us and we will send you a confirmation and payment instructions as soon as we can. You can open the order form by clicking here. The reason why we don't use a shopping basket and let you pay directly online right away like many other companies is due to the nature of our products. Many of the products need personal attention and work done to them before we can ship them to you. Some of our products will be made after the customers specifications. Sometimes we will not even have what you want in stock and have to order it and it will take longer than you have. Considering all of this, it wasn't an option to have a normal web shop. Our main goal is always to make sure that you will be as happy as you possibly can be. Another change that we have done is that all sales now are made in Swedish currency. We have decided to start doing this as the fluctuations on the currency market sometimes caused problems for us and our accountant have asked us to do this change. We still try make sure that you always can see approximately how much it is in your own currency. Both on the order form directly and via links to Oanda bank which displays current exchange rates. We hope this will not discourage you from shopping from Makeup-FX. But we are still flexible!! If you need to pay in your own currency, it's ok too! We do not want to scare away any customers because they don't feel comfortable paying in SEK! Just tell us in the comment section of the order form and we will fix it for you!